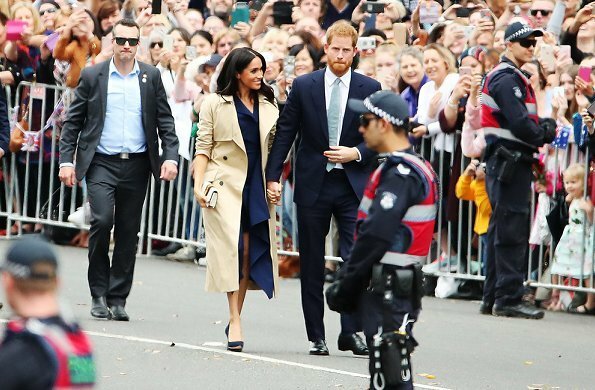 On the 3rd day of their Australia tour, the Duke and Duchess of Sussex arrived in Melbourne. 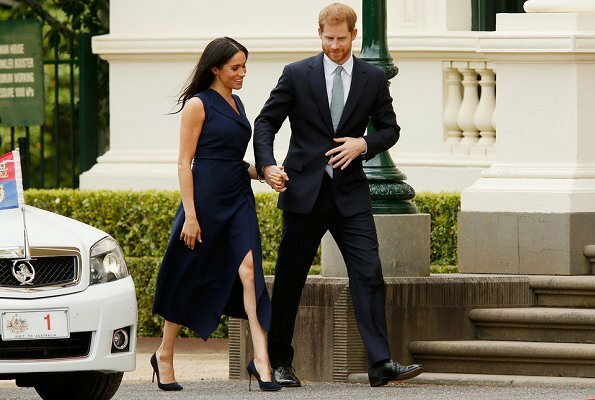 The Duke and Duchess attended an official reception held at Government House. A diverse group of young Victorian leaders and community members attended the reception, including Queen's Young Leader Hunter Johnson from The Man Cave. 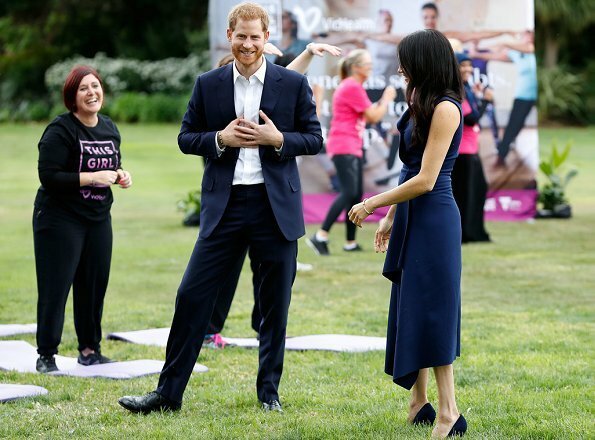 A demonstration of various sporting activities took place in the grounds, with ambassadors from the This Girl Can campaign. 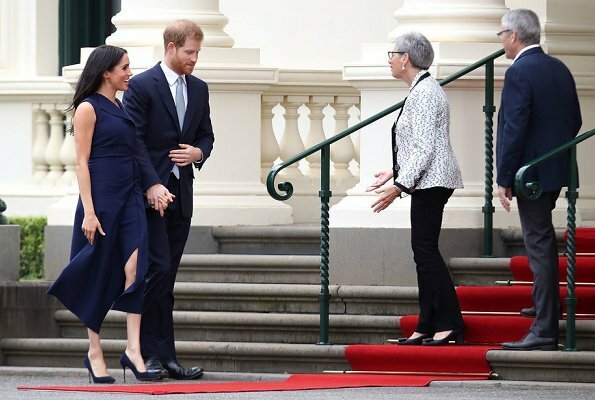 After the reception at Government House, the Duke and Duchess visited a social enterprise café which provides leadership, mentoring and training programmes for young Aboriginal people. 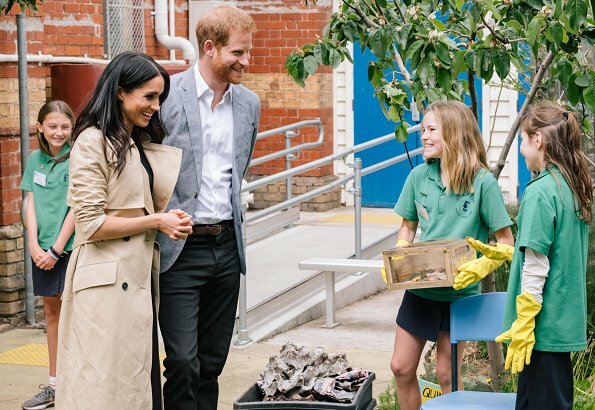 In the afternoon, the Duke and Duchess visited a primary school and met with students who are involved in sustainability programmes. 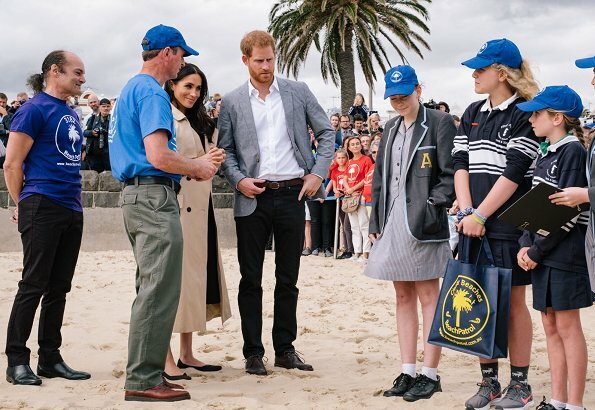 After leaving the school, The Duke and Duchess travelled on an iconic Melbourne tram to South Melbourne beach and there, they met with volunteers from a local beach patrol programme. 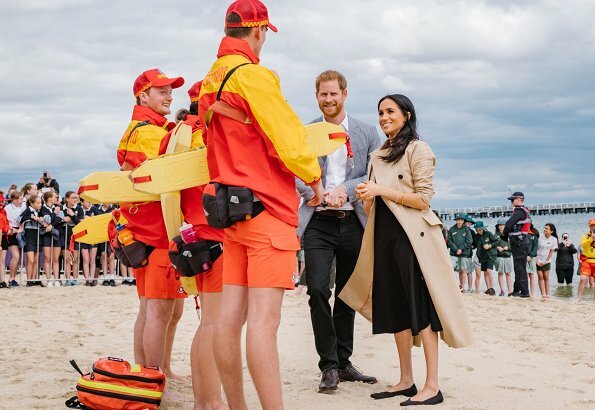 There, the Duchess also received information about efforts to keep Port Phillip Bay beaches and foreshores clear of litter to reduce the negative impact on the marine environment. 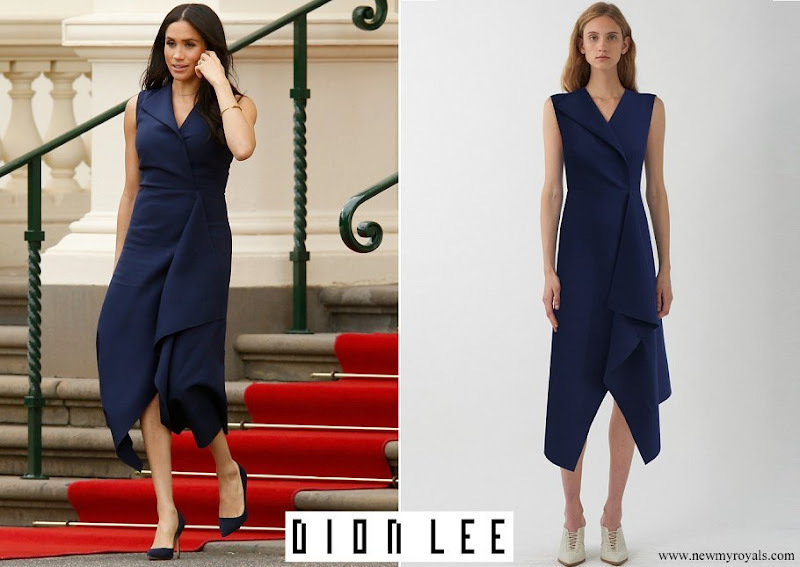 (The Duchess is wearing Club Monaco’s Miguellina dress). I like this dress on her. Nice colour and these drape-style skirts look great on her. Also a lovely gold bangle. Most of all what shines through is her and Harry’s personality. Till now, the tour is a success. Lovely! Nice color, nice and interesting cut. Blue is perfect colour for her. And this dress has a beautiful style. I like the coat as well. Harry looks handsome too. She looks very well with this dress, in my opinion much better than model. Both dresses look good. I like the black one with all the buttons the best. Great choices. Hair looks good and I like the black dress as much as we can see it in these pics. I wish she had a more fitted coordinating coat or jacket. 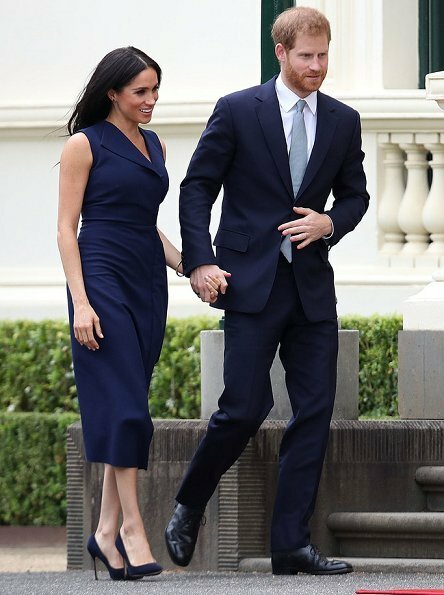 I agree that Meghan suits navy but think there's too much material in the first dress to be smart. Still with the white sheath dress from Day 1 as the best look so far. 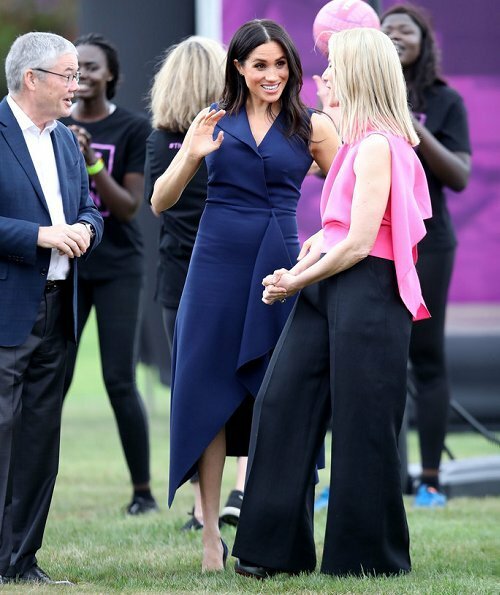 Meghan looks so beautiful in blue. The Dion Lee Folded Sail dress has a lot if interest, and is a nice choice in the early months of pregnancy when the baby bump is small. 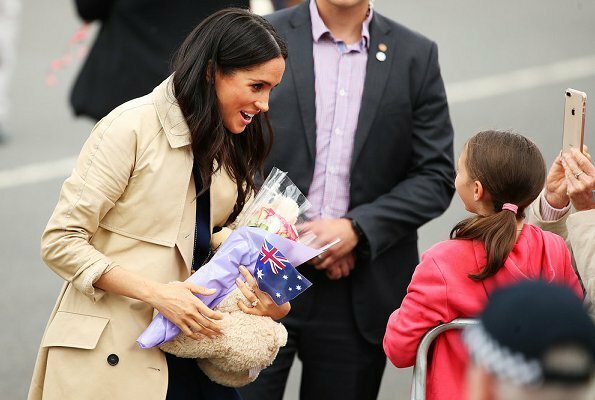 Another fun note is that a little boy made Meghan a necklace that she proudly wore, and can be seen in pic, 3. He is absolutely adorable. The black Club Monaco is perfect for the occasion. I am in love with the button detail down the side. It is very much to her style, and I hope we will see it again. The blue dress is really nice. The black one is ok but not my favourite. 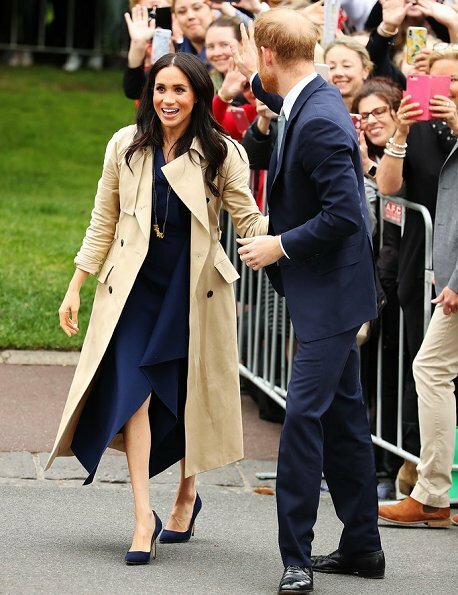 The style with the blue dress is also very nice, but in the end I have to say: usually I prfer Meghans makeup but with the rest of the style I'm more a fan of Kates kind of style. A very happy relaxed couple. It is so beautiful to see the love between these two. A fantastic bond between them. 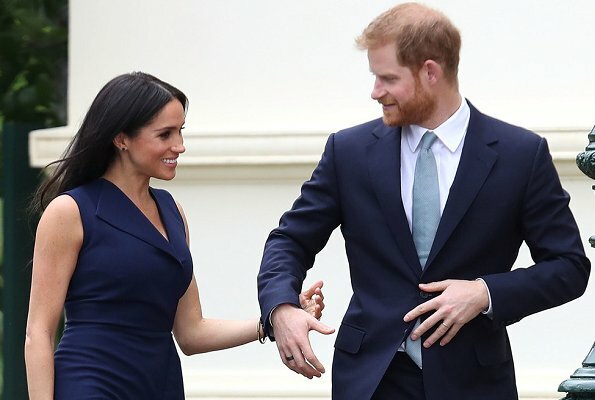 Meghan is talking with the crowd, she is getting right in there.